Visit the most typical towns on the slopes of the highest volcano in Europe: Santa Venerina, Zafferana.... visit on the way some old lava flows, and during the ascent different kinds of vegetation can be noted. We will reach 2.000 meters (7.000 ft) where we then take a walk together to visit the "Silvestri" craters (1986) and the lates new lava flows and craters from 2001 / 2002 / 2003. We will then visit a local family farm where it is possible to taste local Etna wine. 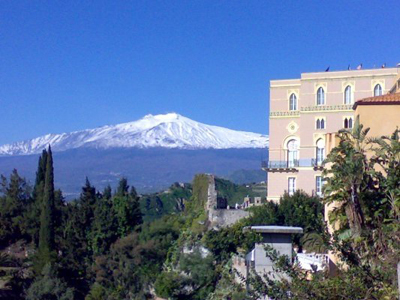 We will then drive you to the beautiful town of Taormina.